The Pinaceae family are resin producing trees (Barker). This magnificent tree is not native to Europe. I did not study this as part of my herbal degree. However, I did cover the essential oil in my aromatherapy diploma training. I love the smell of this oil and find it very grounding. The first two photographs were taken at the Aude Arboretum, where there is a very large cedarwood tree. The other photographs were taken in the Forêt Domaniale de Callong-Mirailles, where there are a group of planted, smaller cedarwood trees. As mentioned, it is not a native European tree. The common name ‘atlas cedarwood’ gives a clue to the origin, the Atlas Mountains in Morocco. Cedarwood oil was utilised by the Egyptians in mummification and the wood from the tree, as well as cypress wood, was used for building sarcophagi. Frankincense, myrrh and cedarwood were used as temple incense aromatics and as offerings to the Gods. It is probable, in Egypt, this was the Lebanon cedar rather than the Atlas Cedar. Cedarwood oil is, described by Price et al, as a lymph tonic and a particularly good choice for lymphatic circulatory problems. West (2003) notes cedarwood beneficial for skin degeneration which can be a problem in oedema cases. 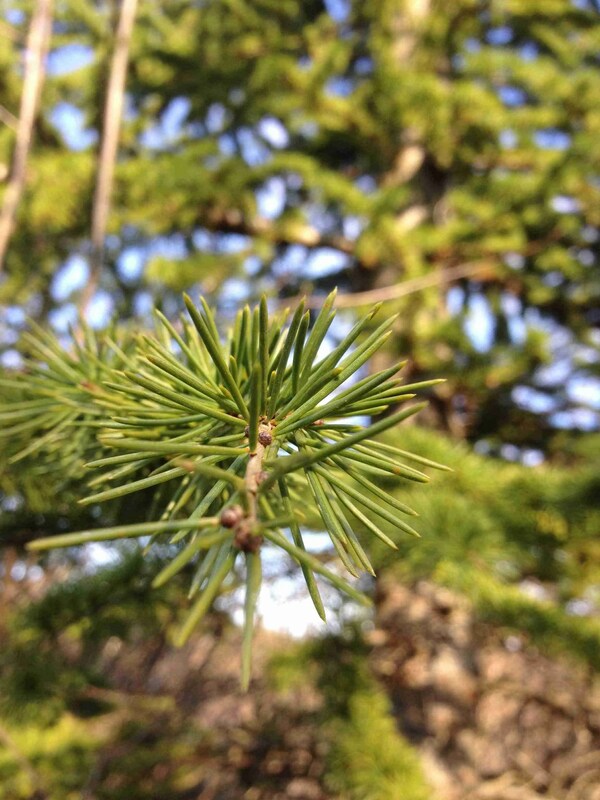 Cedarwood is high in terpenes. Terpenes are hydrophobic, meaning they aid removal of excess fluid from tissues (Price, 2004). 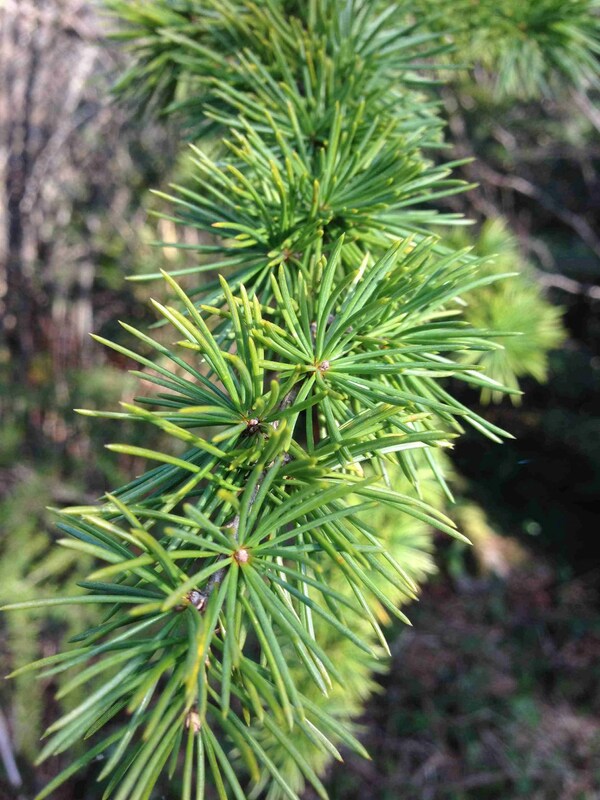 I wrote the following summary of cedarwood oil some years ago when I was regularly working with the oil particularly in aromatherapy therapeutic massage. Physical Uses: More useful for long standing chronic conditions rather than acute ones. Tonic for the glandular and nervous systems regulating homeostasis. Expectorant properties make it effective for the respiratory tract in easing bronchitis, coughs and catarrh. It is also of benefit for genito-urinary tract problems such as cystitis. Good for the skin particularly oily skins and pus conditions and eczema and psoriasis. Excellent hair tonic particularly useful for dandruff and alopecia. The regenerative properties make this oil useful for conditions such as arthritis. Emotional Uses: Calming and soothing action makes this of benefit for nervous tension and anxious states. Uplifting. Regenerating. Gives strength in times of emotional crisis. Steadies the conscious mind. Can ‘buck-up’ the ego when in a strange or unfamiliar situation. Cedarwood contains many constituents. Among these are the sesquiterpenes, cedrene and terpene. Sesquiterpenes are antiseptic, antibacterial, anti-inflammatory, calming and slightly hypotensive and some may be analgesic, antispasmodic, anti-allergic and anti-oxidant. The essential oil also contains atlantone, a ketone. Ketones are calming and sedative, mucolytic (some ketones are expectorant), analgesic, digestive and encourage wound healing. Finally a mighty tree producing the wonderful therapeutic essential oil of cedarwood. At this time of year there is less variety of plant life. However, whatever the season thankfully we always have the trees. The European ash, or common ash, is one of the easiest trees to identify in winter with those black velvet buds and ‘keys’ (see images). The Oleaceae contains mostly trees and shrubs such as the European ash, olive and privet. Jasmine is also in this botanical family. For the bitings of venomous beasts, Culpeper advised using the young tender tops and leaves taken inwardly and applied outwardly. Dropsy and “to abate the greatness of those that are too gross or too fat” were treated with a small quantity of distilled water every morning. Decoctions of leaves in white wine he recommended to break and expel stones and cure jaundice. It is not clear where the stones are though I would presume, based on the jaundice reference, the gallbladder? The bark he used instead of leaves in winter time. Interestingly ash keys, usually also found in winter, he used for stitches and pains in the sides from wind and for removing stones by provoking urine. One assumes he refers to kidney stones here. He noted keys easily kept all year. Culpeper added he could justify all, one assumes from personal experience, except for the bitings of venomous beasts. Whether these venomous beasts were mythical creatures such as werewolves or more likely snakes who knows? However, I guess they were few venomous snakes (or beasts) in Culpepers 1650’s London as he had never had cause to try it! Barker notes its use as a litholytic in Renaissance times, pre-Culpeper. An indispensable timber. Everything from furniture, spears and walking sticks, carts and oars were made from the ash. A tree of magic and mythology. David Winston, an American herbalist, lists the American or white ash (Fraxinus americana) in the American Extra Pharmacopoeia. Both Cherokee and eclectics uses included for pelvic congestion and uterine fibroids. This well known tree was not included in my own herbal training. Leaves and winged fruits are utilised in modern herbal medicine. As is bark, from two to three year old twigs, and the sap too (Barker). Leaflets are harvested without the petiole while young, ideally before the end of June. Harvest bark, from young twigs, in April. Leaves are prepared as infusion and the bark a cold maceration followed by infusion. A syrup of fruits is advised. Barker describes the European ash as a diuretic and anti-rheumatic. Beneficial for rheumatism, gout and oedema. As a febrifuge, for fevers, fruit or bark are used. He describes it a mild laxative although adds not the bark. It is also astringent, here, he notes mainly the bark. Leaves are chewed for bad breath. Barker suggests combining with some peppermint or lemon balm leaves. Menzies-Trull lists many of the same indications as Barker; halitosis, fevers, oedema, gout and rheumatism particularly highlighting it a uric acid eliminator. In addition, he describes ash a slow and persistent remedy. Similar to the American ash, Menzies-Trull, describes the European ash as toning the uterus and indicates ash for uterine prolapse, endometriosis with oedema and enlarged cervix. Coumarins, flavone glycosides, resins, tannins and vitamins are included constituents listed by Barker. The resins and tannins are probably highest in the bark and relate to the astringent action. A German study from 1995 investigated the pharmacological properties of a compound used as an anti-rheumatic. It contains a combination of Populus tremula, Solidago virgaurea and Fraxinus excelsior (European ash). The team conducted various studies. They noted little previous research into Fraxinus excelsior itself however, they found its coumarin components to have a variety of pharmacological properties. The combination of the three herbs was comparable to non-steroidal anti-inflammatories (NSAID’s) without the side effects (von Kruedener, 1995). Governed by the sun (Culpeper). Both Cherokee and eclectics described the bark energetically as bitter and acrid (Winston).